Black stylish practical pocket belt. 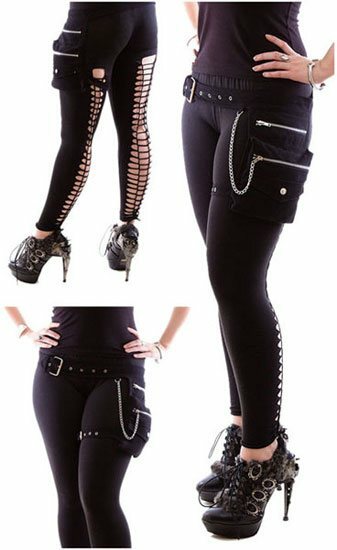 Fastens around the waist while the bottom straps to the thigh. Triple tiered with two zippers and a chain. Made of 100% Cotton. Dry clean only. Adjustable strap. XS-M measures up to 37 1/2 inches. L-XXL measures up to 41 1/2 inches. Imported. I bought mine before going to a music festival and I couldn't be happier. It was very easy to wear and kept my belongings close by. I love my new pocket belt!!! This purse goes with punk, goth, and basically casual school mom attire....I even wear it to walmart! It's so awesome and guarntees you won't lose it, leave it in the cart, or on a counter top somewhere! Make it work with any attire, even a night out in the city!